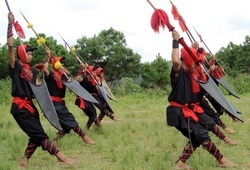 Thang Ta: Thang Ta is the martial art form exclusive to Manipur, with 'Thang' meaning sword and 'Ta' meaning spear. In this amazing display of the traditional art of warfare, performers leap and attack each other and defend themselves. Encouraged by the kings of the earlier times, Thang Ta is an ingenious display of skill and creativity. The art has a ritualistic aspect with some movements of sword intended to ward off evil spirits, while other postures indicating protection. 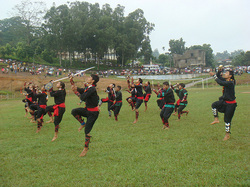 All the dance forms of Meiti people are believed to have originated from Thang Ta.